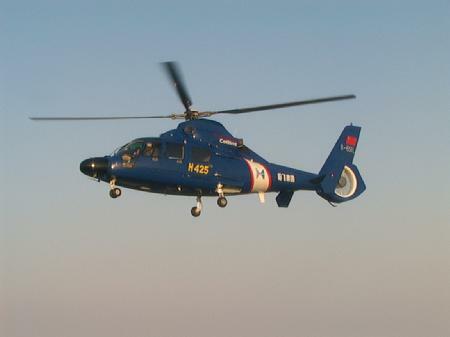 The Z-9-H425 entered service in 2005. The helicopter featured an electronic flight instrumentation system from Rockwell Collins; the glass cockpit is also from Rockwell Collins. Maximum internal and external payloads are 1,900 kg and 1,600 kg, respectively. The aircraft capacity is 12-13 passengers. The H425 is the improved version of the H410A, a Z-9 variant. After the initial flight of the H425 in December 2003, the helicopter received CAAC certification in December 2004. The value for "Landing gear track" is an approximation using the inner and outer measurements (1.90 m and 2.02 m, respectively) of the wheels. Resources related to the H425 , provided by the Vertical Flight Society. Resources related to the H425 , provided by public sources across the internet.